DeVotchKa is certainly a band you'll never understand until you see them live, but more importantly, they're a band that you can't not watch once they take the stage. Standing at the surprising crossroads of indie rock and Eastern European folk music, DeVotchKa's unique blend of DIY punk, traditional dance music, norteno, burlesque and vintage cinema sounds first came to international attention when they received a Grammy nomination for their soundtrack to the 2006 Oscar-winning indie flick Little Miss Sunshine. The band breaks six years of radio silence with the late 2018 release of their 11th studio album This Night Falls Forever, hitting the road this fall to bring their long-awaited new material to stages across North America. If the album's lead single 'Empty Vessels' is anything to go by, DeVotchKa are back with a vengeance and as ambitious as ever. Textured orchestral arrangements, percussive synths and the classic indie rock band set up herald a return to fine form. Weather backed by a full orchestra or performing in more intimate settings, the genre-bending outfit produces a stunning live sound that's passionate, somehow danceable and relatable thanks to frontman Nick Urata's gravel-edged, heartbreaking croon and candid lyrics laden with personal stories and emotional depth. Seen DeVotchKa? Loved it? Hated it? Sound good to you? 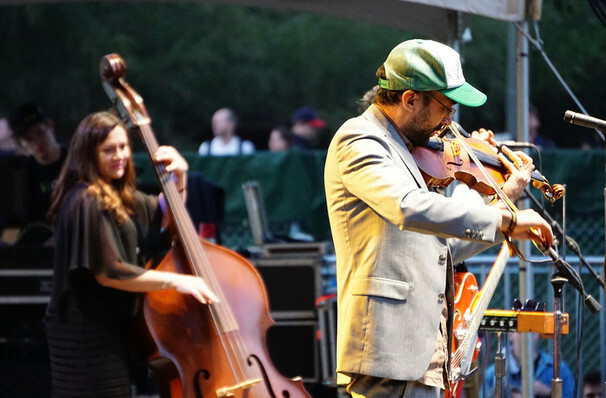 Share this page on social media and let your friends know about DeVotchKa at Vic Theater. Please note: The term Vic Theater and/or DeVotchKa as well as all associated graphics, logos, and/or other trademarks, tradenames or copyrights are the property of the Vic Theater and/or DeVotchKa and are used herein for factual descriptive purposes only. We are in no way associated with or authorized by the Vic Theater and/or DeVotchKa and neither that entity nor any of its affiliates have licensed or endorsed us to sell tickets, goods and or services in conjunction with their events.